All signs were pointing to a hike a bike event with the warm temps coming in, but the trails held up amazingly well and the 2017 906 Polar Roll was a great event. I know there was a ton of effort put into prepping the trails and creating a solid base that would hold up to the 40 degree temps the day before the race and on race day itself. Huge thanks to all the event staff and the trail crew for making this a really awesome event. The race started and finished from downtown Ishpeming to make a single full loop course of around 21 miles for the long race. The big climb up Hill street at the start of the race was a great way to start thinning out the traffic a little before hitting the singletrack. 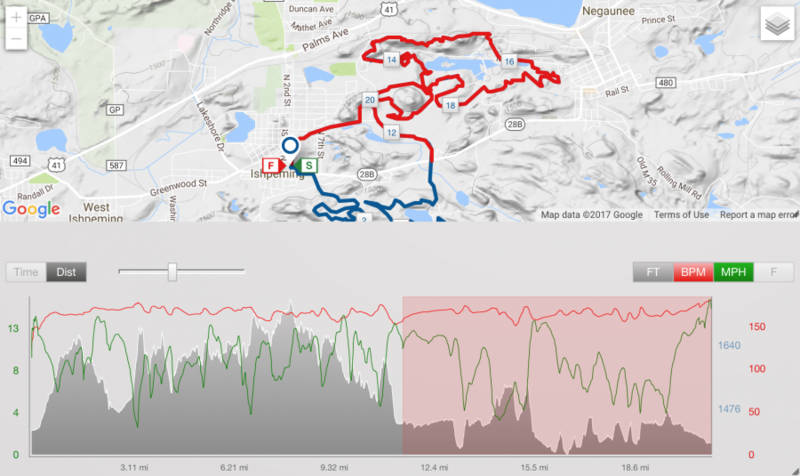 Distance – 21 miles according to Training Peaks and Strava. 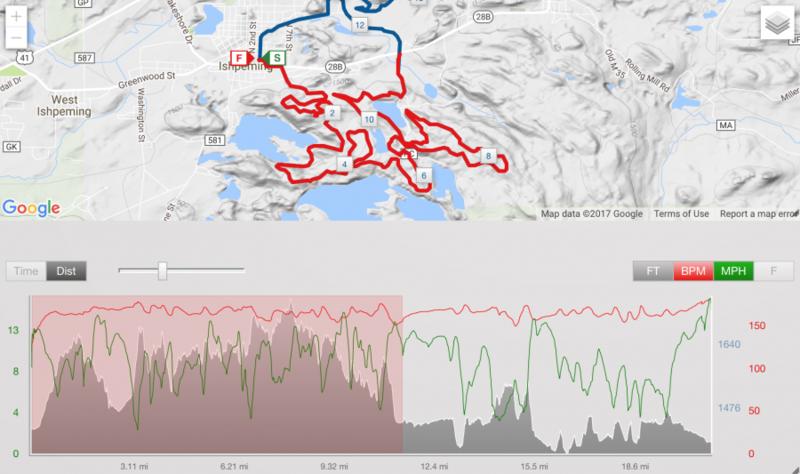 Elevation Gain – 1,710 ft according to Training Peaks and 2,278 ft according to Strava. I rolled out on the conservative side as I had been sick for a couple weeks and hadn’t raised my heart rate for awhile, until just a couple days before the race with a few short intervals on my trainer. I write about this often, but I tend to go out a little harder than what I should, just to see where I stand. Since I had been sick the previous few weeks and not even finished with my antibiotics, I figured it was best to ease into things. Hill Street actually went by fast and when we did hit the trails, I was wishing that I had pushed it harder up the hill as I was stacked up at the end of a line as we started to ascend the singletrack. There were folks behind me as well. I try to give myself some space in the singletrack and hate riding somebody’s wheel. I find it to be a bit of a balance, because it seems like if you are not right on the wheel of the person in front of you, then the folks behind you assume you are falling off and want to get around you, even though you are just giving yourself some space. When we’re all stacked up like that, you have no escape when the person in front of you has to bail on a climb and then there is a domino effect. At least if I have a bike length in front of me, I have an extra second or so before coming up on them and have a better chance of staying on my bike in the process. We were less than 2 miles in and the trails were packed well, but we did hit a few glazed over slick spots and the rider in front of me slid out and went down. I made it around, but then lost my front end around the next corner and went over the handlebars myself. I must have gotten passed by at least 10 riders here as I had to wait for a clear spot to jump back in line. I crashed again less than a half mile later, but was able to get back on before the next line of riders came through. Now I was becoming more than cautious on the dowhills. The trails were in amazing condition for the weather that had hit, but there were those few glossy spots. Not icey, just a light glaze in a few spots. I finally caught back up to the line of riders that had passed me on the first crash as we were coming to a steep climb and everybody started bailing. It was steep and I think I might have been able to make it, but the bailing tuned into a domino effect as we started to stack up. About half way up the hill, everybody was cleared off the main trail and walking the edge. There was a very short section that slightly leveled out just enough for me to jump back on my bike and I pedaled the rest of the way up the hill. That quick decision was huge as I was able to get back around most of the folks that had passed me when I crashed earlier. I now had some clean riding in front of me with a few folks on my tail. I was feeling really good, but playing it safe on the downhills or faster sections of trail. I had another time that I thought for sure I was going down and can’t believe I saved it. The front end slid out on me… I went back and forth a couple times and was able to pull it together and stay up. In general, I was feeling good and was climbing really well. It seemed like each really tough hill climb, I would pick off another rider that had to bail while I was able to stay up. There were a few folks right behind me and making the climbs also, but it seemed like I would get a gap on the climbs and then they would catch me again on the downhills. I knew we were getting close to the end of the hill street trails and we eventually dumped out on some snowmobile type trail before hitting the road crossing. There were some cars coming and road rules applied, so I had stop and wait for a car to pass before crossing and then I was on way into the SBT loop with a few riders on my tail. 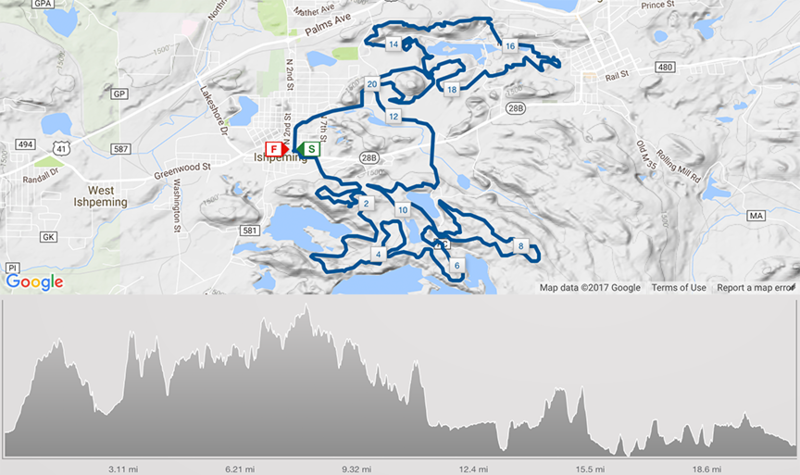 I don’t know exactly what to think of how I was rolling through the SBT loop, but again I was still feeling good with my climbing and the flats, but being conservative on anything tight. We entered some tight singletrack where I made up another spot on a hill and started to create a gap behind me. This was in a section of trail split off from the short course and was really tight. The trail conditions were amazing, relative to knowing that the entire short course race had already came through. I made good time on the north side of the SBT loop, but noticed another rider making a good push behind me and was creaping up. I was feeling comfortable, but could start to sense a bit of fatigue building up in the legs. Not a ton, but it was there. There was a long flatter section of trail that led into Negaunee where I dropped down the flight of stairs and then started heading back toward Ishpeming on the south side of the SBT loop. Time was going by fast, but I thought I had more distance to cover and I actually dialed back my pace a little bit thinking I needed to conserve a bit of energy. I slipped my rear tire on a short little uphill and had to step off and let a couple riders by that had been making ground on me. I got back on quickly and caught back onto their wheel and then eventually got back around 1 of them and then sat on the wheel of the next one. I was still thinking we had some more mileage, so I was riding a little conservative. Then, we dumped out of the trails and were hitting the snowmobile trail and I knew we were headed for the finish. I think there were 4 of us that hit the trail together and I was 3rd in line. I stepped out and made a pass to the front, not knowing exactly how much further we had to go, but also knowing I would likely run out of gears once we hit the pavement. The others stayed on my wheel and I wasn’t able to make up any ground and then 1 or 2 of them came back around me near the end of the snowmobile trail or as we hit the pavement. I can’t remember exactly, but when we hit the pavement, the first 2 dropped me like a bad habit and were gone. I was out of gears and the third rider came around and pulled away from me also. I’d like to think it was because I ran out of gears, but they likely just had more legs left in them than I.
I ended up finishing in 30th place with a time of 2 hours, 12 minutes and 45 seconds. I had to head out of town right after the race and missed the after party, but I did stop into Irontown Pasties to grab one of their bacon cheeserburger pasty for the road. They were actually at the finish line of the Marji Gesick and I remembered how good that pasty tasted after a bike race and couldn’t resist. 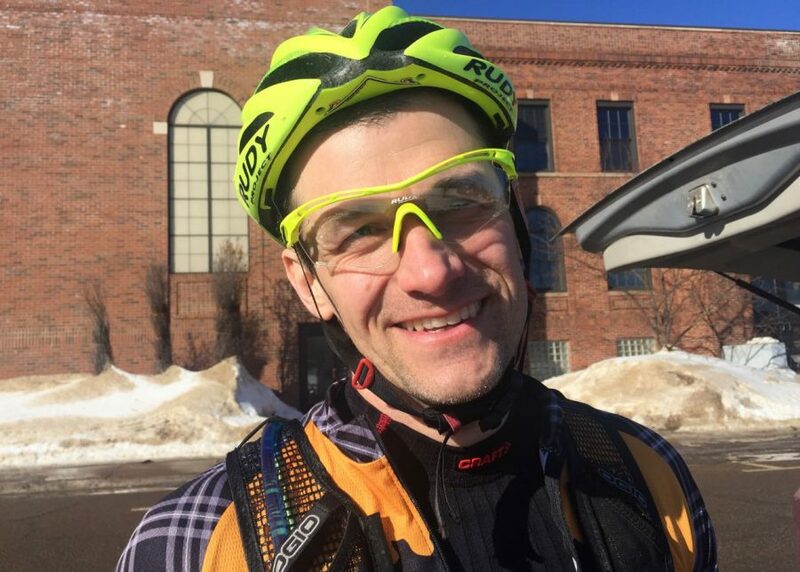 As far as the race goes… Marquette County never disappoints and this year’s Polar Roll was awesome! I am still amazed at how well the trails held up to the warm weather and I really enjoyed the course layout. It was definitely a much shorter race than last year, but I enjoyed it and felt really good after the race. In fact, I probably felt better than I have felt in a few weeks and kind of felt like riding some more. I think it was the bright sun and the fact that I was able to get out on my bike and didn’t cough up a lung in the process. This was only my 3rd ride on snow this whole season and likely the same situation for many of the other racers, given this year’s weather. The last time I rode my fat bike on snow was on New Years eve, when I was checking out the trails in Ishpeming. Based on the weather we continue to have, it’s likely that I won’t hit snow again until next winter.